BLOC, Studio Marco Vermeulen and Urban XChange offer a shifting perspective to the world on circular development. The Dutch Mountains: smart building, smart environment en symbool van een radicale stedelijke ontwikkeling. En een innovatiehub and platform for all technologies from the Brainport Eindhoven that are connected to it. The Dutch Mountains is a residential and working landscape that will enrich the Eindhoven region. All kinds of high-tech innovations are applied in the complex, symbolising what is called the smartest region in the world. These technologies make the building a highly advanced complex that sets new standards for sustainable development. The building will be maximally self-sufficient, with closed cycles in the areas of energy, water, waste and materials. The Dutch Mountains stands for green, happy and smart living. An extremely inspiring, healthy, circular and interactive environment. With an interesting mix of users, functions and activities. Working, staying and meeting take place side by side and with each other. In an environment full of high-tech innovations for which the region is renowned. Because the Eindhoven region is a global phenomenon. To further expand this position, the region is fully committed to improving the agglomeration power, connectivity and the business climate with the Brainport City programme. The focus here is the International Knot XL, the area around the station and the TU/e campus in Eindhoven. The municipality of Eindhoven aims to make the railway zone grow into a metropolitan and green environment where it is bustling. The Dutch Mountains fits seamlessly with the ambitions of the municipality of Eindhoven. That is why The Dutch Mountains is located in the centre of Eindhoven. 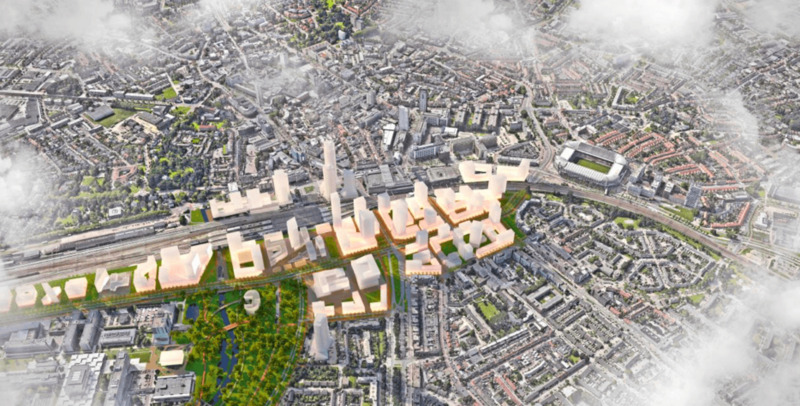 An iconic design and a tailor-made programme will create added value for the station area, the city of Eindhoven and the Brainport region.